Take the passionfruit and scoop out the fleshy interior into a cocktail shaker. Add the rest of the ingredients, except the ginger ale, and shake vigorously with ice. You want to really mix up the passionfruit into the liquids. Double strain into a ice filled rocks glass before topping up with the ginger ale. 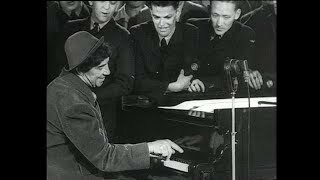 A Year to Remember: 1948 - Chico Marx plays "Waltzing Matilda"